Successful strategic leaders force themselves to look beyond the present. They see ahead, see behind, see beyond and see it through. 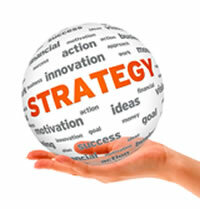 They realise that strategy is more than processing a plan and requires them to have a strategic mindset and approach. They see leadership as greater than the individual leader - interdependent, boundaryless, collective and connected. Without this, even the best and boldest plans wither on the vine, their potential never realised. Without strategies, vision is a dream. Participants will have a greater awareness of what strategic thinking is and how to apply a strategic mindset in their everyday work. They will understand the power of strategic thinking and how it must permeate throughout the school. They will be armed with strategic tools to apply to leadership issues. "Vicky, I just wanted to say THANK YOU to you for a wonderful day." ; "Excellent quality training - exactly what we needed." ; "Fantastic trainer who has excellent subject knowledge." ; "Thank you, as always the course will be instrumental in helping us to continue to move our school forward and raise standards." This training can be delivered in house for your whole senior leadership team or for groups of senior leaders across a number of schools. Ideal for groups of twenty with at least two senior leaders from each school. This training is a full day. £675 for one school, £450 per school for two schools, £400 per school for three schools or more. Maximum 20 people. An off-site venues / refreshments can be arranged for an additional cost. If outside West Yorkshire an additional 40p per mile is charged plus overnight accommodation where applicable.